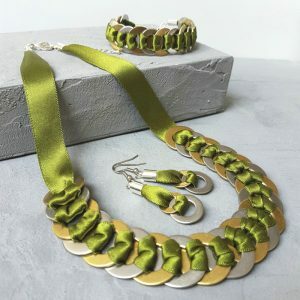 We’re kicking this week off with some wonderful handmade gifts and trinkets; including but certainly not limited to textile jewellery, a few illustrations as well as some ceramics. We’ll start the post of with the very talented Paula of P&D Designs. 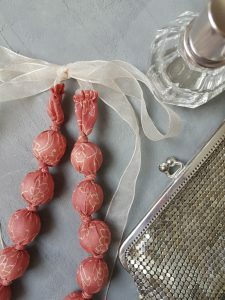 Based in Barry, this mum of two finds herself seeking solace among her craft and we are so glad she manages to gather some time in her busy days to create these modern and very tactile pieces for us all to enjoy. I have always had a passion for colour and texture and I think it’s these two qualities that most help me create my designs. 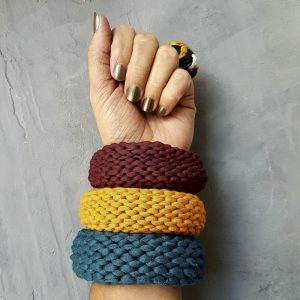 I use a lot of braiding and knotting techniques so nimble fingers is a must! Paula finds inspiration from her kids, as well as the colours and textures in nature and art around her. 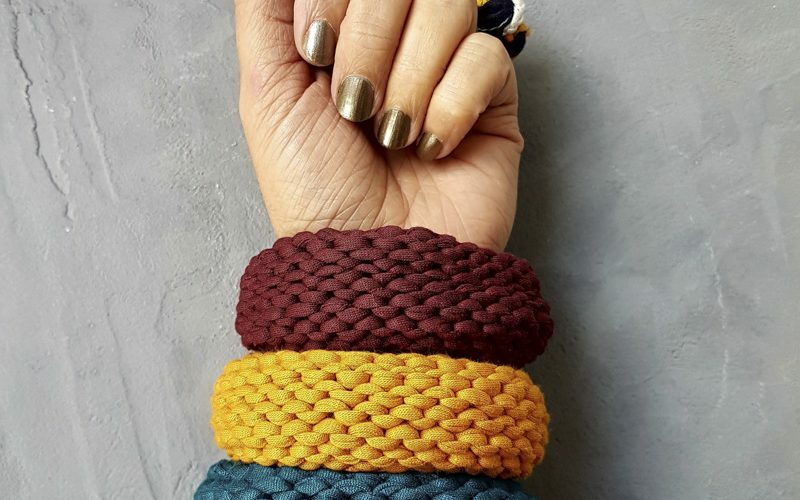 We are absolutely in love with her knitted bangles and the variety of colours means there’s one for every occasion or person. I have a textiles background having obtained a degree in Constructed Textiles (many years ago!) and subsequently worked in the fashion & textiles industry in London before relocating to South Wales. After an 8 year gap of working (for a professional services firm), getting married and having 2 children I decided it was time to get back to being creative and P&D was born! Paula loves to relax cwtched up on the sofa with her favourite boys and hubby by her side watching a good film, but if you don’t fancy pulling up a blanket and couple of cushions then head over to her Facebook and Instagram, page for more insights into P&D Designs. 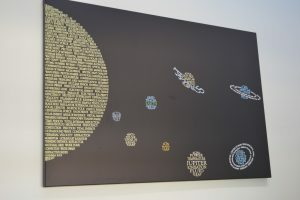 Next we have the lovely and very creative Carys of Carys L, producing typographic prints of well known landmarks, scape and great custom gifts we love how each design has something completely different to stare at. I design bespoke typography pictures – you choose the shape and words, and I do the rest. If you’re struggling for ideas, you’ll be able to see hundreds of examples at EML which may be just the inspiration you need to commission something different. I’m currently studying Engineering at Cardiff University and juggling designing typography pictures with designing train stations! I find the right shape and style, and then use the computer to insert every piece of text; resizing, rotating and redesigning until the picture is just right. 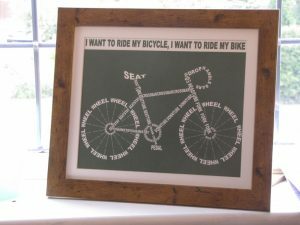 All designs are printed on high quality card and framed so they look perfect forever. I started designing and selling typography pictures in 2013, predominantly at local coffee mornings or through word of mouth. It suited me a lot more than a typical Saturday job as I didn’t have to ask for a lift very often! Since then I’ve started selling online through my own website, Etsy and Facebook with designs being sent worldwide. My pictures often end up inside people’s homes which is fantastic…. but I don’t get to see them! I would love for my designs to be featured on clothing, which is something I’ve been working on behind the scenes. Please chat to me at EML if you want to find out more. 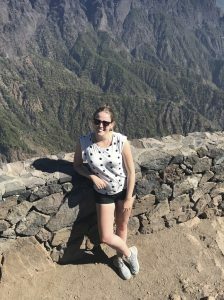 We’re excited to see where Carys L will go in the future and can’t wait to see her designs in stores or even a T-shirt nearby in 2019. Turning ideas into something that makes an impact. 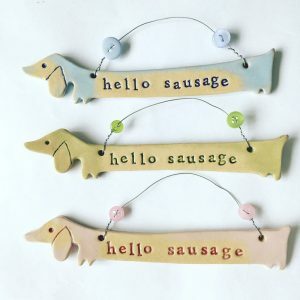 I love creating bespoke designs for my customers, using their knowledge of the recipient and my design skills to create something that they will love. 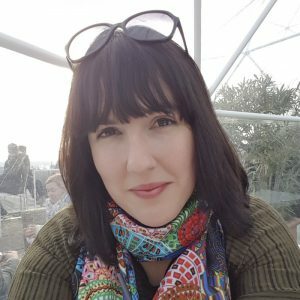 I’ve been involved in CavEtsy since I moved to Cardiff for university in 2015. Everyone has the same passion for crafts, and being part of this community of Etsy sellers is fantastic! EML is an amazing event which helps showcase all of our different talents, and I love being part of it! 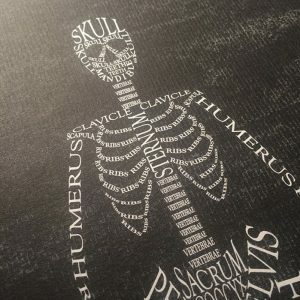 At Cardiff and Valleys Creative HQ we love to snooze under our duvets but if you fancy a more active approach to getting to know Carys L’s collection head over to her Instagram and Facebook page to start browsing for your favourite prints. We finish this Meet the Maker post with Quill from Love & Lovelier, a ceramicist based in Cardiff. 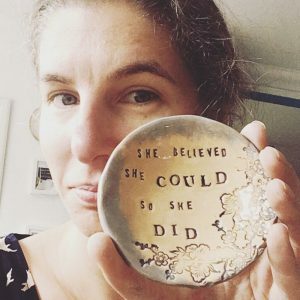 Hand made ceramics that use a variety of methods and mostly include heartfelt messages or quotes that you’ll want to cherish. Short fingernails, and smooth fingertips – it all about the smoothing of the clay at the first stage of making. Then at the glazing stage it’s all about detail so there are no streaks or blobs in the finished colour. Inspirational quotes, beautiful colour combinations, and things made from unexpected materials. 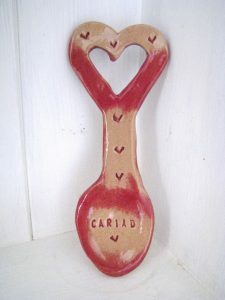 One of our favourite makes of Quils has to be her love spoons, such a sweet modern twist to the traditional wooden ones that will be perfect hung in the hall way or kitchen. It all began with my children being diagnosed with Cystic Fibrosis. To cut a long story short, I ditched the 9-5 office job and founded L&L so that I could fit all the hospital stays and medical regime in. In the future I’d love lots more stockists, and to be able to employ someone to help in the studio. Knowing that all the designers/makers have been part of a similar journey in their business, and we all come together once a year to collaborate for EML. Quill loves to spend her spare time on the sofa snuggled up with her dog. But if you don’t fancy relaxing with these guys touching up on our creative skills then head over to Love and Lovliers Facebook or Instagram pages. 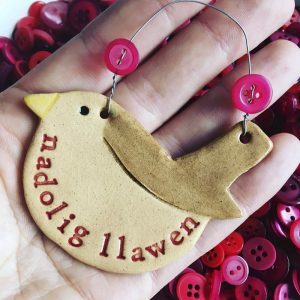 Be sure to follow The Cardiff and Valleys Facebook, Twitter and Instagram pages for more insights into these lovely makers and more information about Etsy Made Local.